These days, more and more employees are working from home on a regular basis. In fact, Global Workplace Analytics says that about 2.8% of the total workforce work from home at least half time. Nearly all U.S. workers say they’d like to work from home at least part-time, and about half the workforce say they could work remotely at least some of the time. But what if you’re not one the lucky ones who stumbles into a job that already allows working from home, whether sometimes or on a regular basis? In this case, you might need to convince your boss that working from home is a good idea. And, in fact, working from home is a good idea, much of the time. It can actually save you money, and it can reduce your overall stress level. And if you’re like many people, you might actually get more done in less time when you’re working from home. But those arguments, especially the ones that are mostly beneficial to your personal life, may not be enough to convince your boss to let you work from home. Here are four more convincing arguments to try. Working from home isn’t a good fit for all jobs, but for some types, studies show that working from home actually increases productivity. This is due to fewer interruptions and in many cases, less distractions. Plus you won’t be pulled into a meeting you have no business being in simply because the boss saw you on his way in. Outfitting an employee with an office or even cubicle comes with overhead costs. Not to mention all that water you flush down the toilet on bathroom breaks! In fact, many large employers started moving employees to work from home positions specifically to reduce overhead costs. Of course, you’ll be taking on some of those costs by working from home — increased electricity and water usage can eat into your savings on commuting. Luckily though, you might be able to write some of this off on your taxes. Having the ability to work from home often curbs the number of sick days you take. You might not drag yourself into the office when you’re feeling under the weather, but you may opt to work as normal from your comfortable couch. Your fellow employees will appreciate fewer germs, anyway. 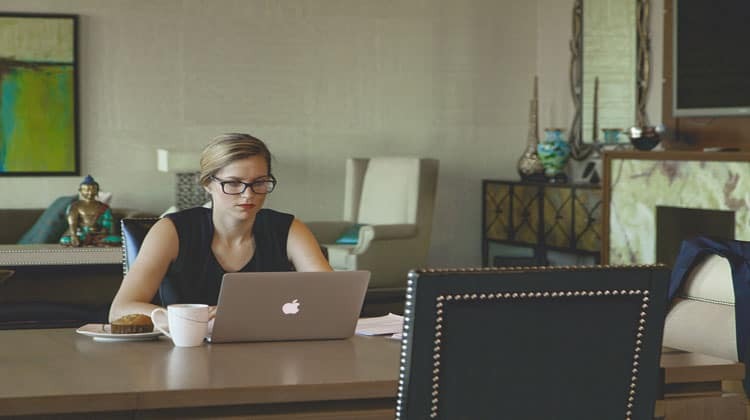 If working from home is really important to you, and if you’re in a field where it’s common, you may be more likely to stay in your job for the long term if you are allowed some flexibility to work from home. You don’t necessarily need to tell your boss this, but you can show that employees who work from home are happier in their jobs. Don’t just approach working from home by the seat of your pants, especially if it’s not already a common practice in your workplace. Instead, create a formal proposal for what working from home would look like for you. What tasks would you accomplish at home? How would you handle meetings and phone calls? Would you be available during certain hours online? How would you keep track of the tasks that you’re working on at home? What sort of accountability system could you build in? Put all this into writing. When in doubt, talk to someone else with a job similar to yours who works from home. See what kind of arrangements they have with their employers, and go from there. If others in your organization work from home, talk to them about their written work plans, too. When you’re creating your proposal, try to think about it from your boss’s perspective. What concerns will he or she likely have? You know this person best as a supervisor, so you can likely anticipate how the conversation will go. Again, talk to others in your organization who work from home sometimes or regularly, and use that as a jumping off point. You’ll want to work those points into your written proposal, preferably, or at least address them in your conversation with your boss. Don’t just jump in and ask to switch your in-office job to a full-time, work-from-home position. Instead, propose a trial. You may want to propose a part-time work from home schedule of one to three days per week at first. And you should also suggest trying to work from home for a period of thirty to ninety days before you and your boss formally evaluate the situation. Starting with a trial period can help make working from home more palatable. Plus, if you’ve never worked from home before, you may find that a blended schedule of in-office and at-home actually suits you better than working from home full-time. Go into the conversation with your boss with goals and a proposal, but be willing to take his or her feedback into account, too. Be flexible in what you’re asking for, and be prepared to give up ground if that’s what you need to get your foot in the door. Maybe your three days a week goes to two, or your 90-day trial goes to 30. It’s still a start! #5. What Else Can You Give Up? Oftentimes, people who really want to work from home are willing to take a pay cut to do so, or at least forgo a big raise. This means that evaluation time can be a good time to ask for work-from-home privileges. If you get a great review and are offered a raise, consider counter-offering a smaller raise with the ability to work remotely part-time. Maybe you’re not willing to give up a raise, but you have other privileges you could lay on the table in order to work from home. Or maybe you feel you’ll be so much more productive at home that you can tackle additional responsibilities. Either way, you could give a little to get a little in this conversation. Finally, when you do get to work from home, don’t take advantage of the situation. Put 100% into your work each day, and set up your lifestyle so that you’re more productive than ever. Keep track of your goals, metrics, and to-do lists, so that if there’s ever a question of whether or not you can work from home well, you’ve got data to back up your answer. Does Credit Repair Actually Work? Such a great article. It’s amazing how comfortable and familiar surroundings can increase the productivity levels. So true. The more comfortable you are, the more likely you will be productive. I’ve been in very uncomfortable work environments and my productivity suffered greatly as a result.